Virtually a month after Kentokyocon, I’m heading out to a con again–this time in Atlanta, GA.
Preparations were not without hitches this time, however. I was only able to have one new picture done in time for printing (I had wanted two), neglected to check my business cards until it was too late to order more, and had a general sense of inferiority setting in, feeling like I wouldn’t have enough of anything and wouldn’t be interesting enough to people walking by. But a lot of good is coming out of this experience already, and it’s hardly even begun. We’ve ordered and/or picked up lots of new things such as clothing, a paper cutter, a rolling cart, and more that should help make this con go even smoother for us, even though they are small things. (And I have plenty of new things to write reviews on too!) We have realized big, mental roadblocks that have been causing us to sabotage ourselves in our respective walks, and our goals, and perhaps now we will be able to move forward at a pace a little better than a snail’s crawl. For this weekend, we are praying for good health and, of course, good sales, as I’m sure everyone else is! Of course I hope the other artists do well too. ^^ But I am also praying that we will be able to take what we learn, realize, and have already realized from this trip back home and put it into action. 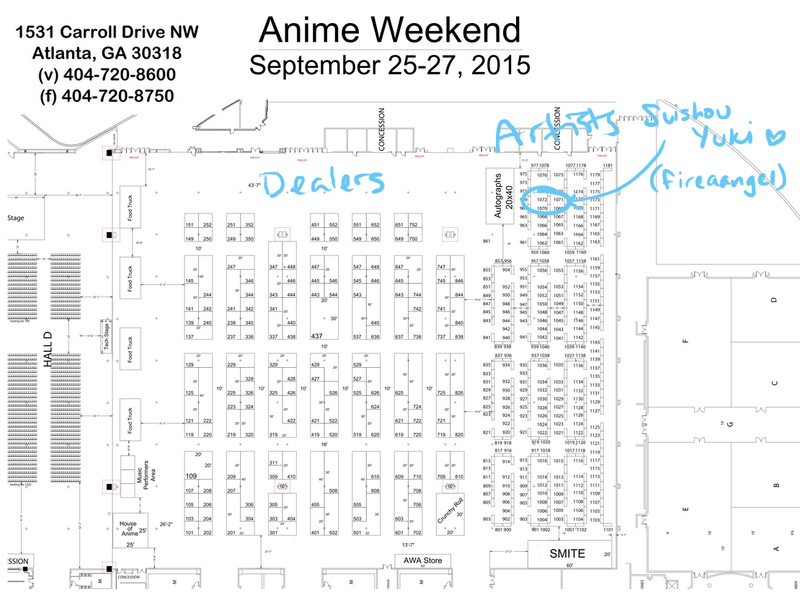 This will be our fourth con (third if you count MTAC twice) and each time we go, we learn a lot. Each area is different and has different tastes, for example; different prints sell better at different places. Anyway! We arrived yesterday and today we’re just hanging out. In fact, the only thing we have to do is pick up our badges; everything else is optional. We may set up our table but we aren’t sure yet. 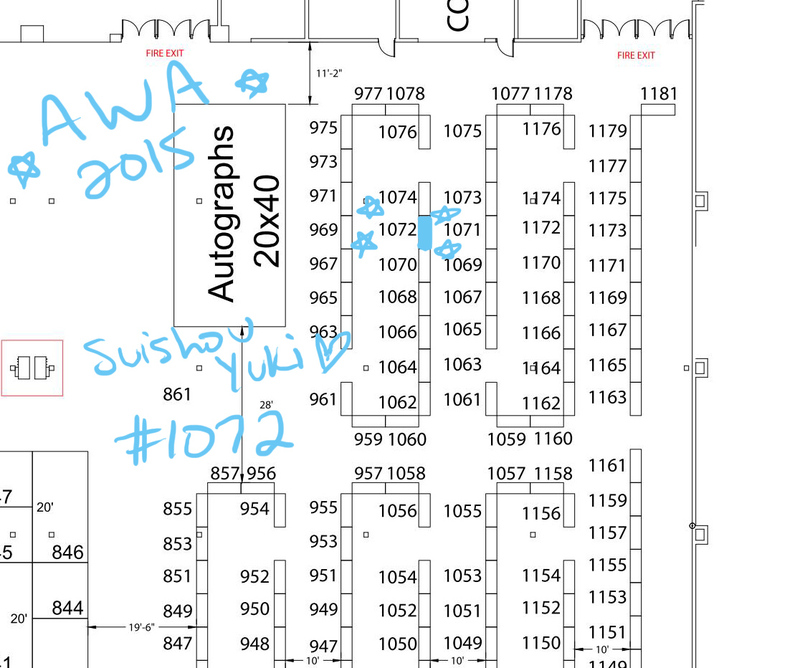 Starting tomorrow, I’ll be here–table 1072! If you’re free and in Atlanta this weekend, please come by! I love that you’re so positive. How cool that you get to have such an awesome experience while something you love and are so good at. It was such a great start to my AWA weekend to run into you at registration yesterday. I will also be praying that you have a fun, healthy and successful time here in Atlanta! 🙂 God bless! Hi, Katie! Thank you so much again for your comment and prayers. It means a lot! Was so lucky to discover you at Anime Weekend Atlanta 2015! Loved the Tendo Kisara sketch you did for me and couldn’t believe that you were able to do that in just a few hours. Super excited to see you rise to the challenge of the more detailed commission I asked of you. You are an artist of no small talent and I’m happy to patronize you and hope to see more of you and your work at future conventions! へえー 凄いじゃん… あなたはとても上手です! あなたの日本語の方が私より強いかもしりません. 私はもっと頑張らなければなりません. Doh, should have been 楽し見にしています.